We’re lucky enough to live in an age where we have the luxury of using technology to help with day to day lives. Not too far in the past, this kind of thing was purely a dream but now that it’s here, many of us couldn’t live without the technology that’s been introduced. Technology doesn’t just stop at our handheld devices and computers either, as there are now many gadgets that can help make home life easier than ever. Interested? Take a look at these smart home automations so that you can turn your home, into a smart one. As aforementioned, it makes life easier! There are arguments that technology and smart devices make people lazy, and while some elements of that might be true, it poses the question: why shouldn’t we be a little lazier? Because of all of this, getting through one day is a bigger task than it used to be, so if you can make life easier at home then why shouldn’t you? So how can you make your home smarter? It’s fairly simple to add smart features to your home, but you should think about factors that would, in fact, benefit you the most. If, for example, you live alone, using a multiroom HDMI matrix system wouldn’t be beneficial because you simply have no need for it. Take a look at these smart home features that you could use so that you can figure out what kind of smart features you want for your home. Time is precious, and if you’re working long hours it’s likely that when you arrive home after a long day, you simply don’t want to catch up on your to-do list. However, this can be a problem when one of your tasks is something that will affect your home. Watering the garden, for example, can be a task that takes a considerable amount of time depending on the size of your garden. Luckily, rather than spending time watering, you can now buy an automatic watering faucet to gently water your garden throughout the day. Or, when you do have to do DIY, a hugely time-consuming task is making sure your measurements are straight and correct. Why not make life easier with a laser tape measure? It will save both time and lots of stressful situations! The Roomba is a robotic vacuum that saves you having to vacuum your floors each day. It even detects when the battery is low and heads back to it’s charging port. All you have to do is empty it from time to time. A robotic mop to take away the chore of mopping! Again, all you have to do is fill it with your favorite cleaning solutions. Nobody likes scrubbing their home to then have to go back over everything to disinfect it all. A sanitising wand will ensure that all of the germs you’ve cleaned are truly gone. Or, if you really can’t be bothered, you could use your assistant like Siri or Alexa to remind you to arrange a cleaner to do all of the work for you. 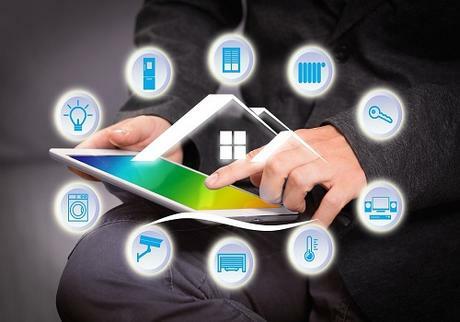 Turning your home into a smart home isn’t difficult and doesn’t have to be expensive either! As you can see, many of these make your life so much easier so that you’ve got more time to put your feet up! Which one will you try first?